We all know Elon Musk is far from shy when it comes to his ambitious claims but today's announcement could change the world as we know it. At the International Astronautical Congress today, Musk told audiences he aims to start sending people to Mars in 2024 in the same SpaceX 'BFR' rockets he hopes will carry people to any city in the world in under an hour. London to New York, he claims, will take no longer than half an hour. His claims will have raised eyebrows and will certainly not be without criticism. It's hard for us to even imagine the possibilities of inter-planetary travel or journeying around in the world in our lunch breaks. But then again, it was only 100 years ago that Nikola Tesla declared to a dumbstruck audience that it would be possible to “transmit wireless messages all over the world so simply that any individual can own and operate his own apparatus.” And just look at us now! We spend more time using mobile technology than we do sleeping - it has completely changed our experiences of the world. 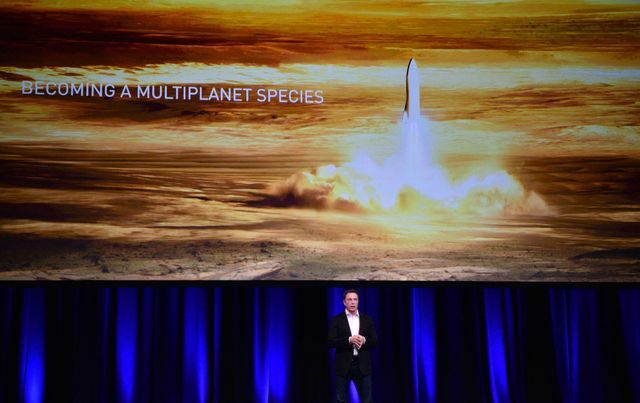 The SpaceX boss hopes his company can land at least two cargo ships on Mars by 2022. And humans will come just a couple of years after that, he said, ready to make use of the power and infrastructure that will be dropped by the autonomous craft.